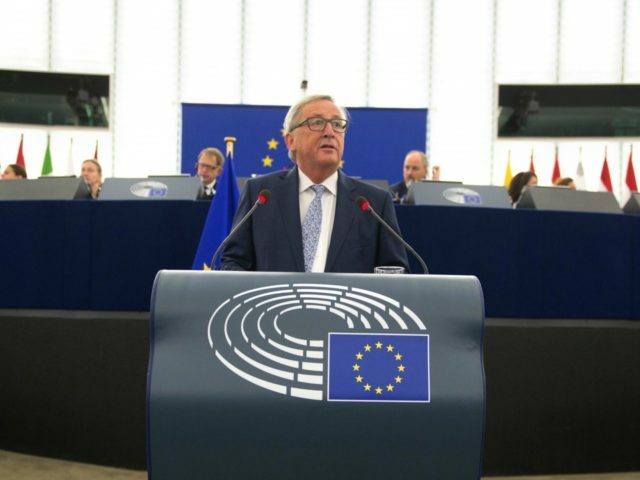 Jean-Claude Juncker, the president of the European Commission, has called for the European Union (EU) to rapidly push ahead with the creation of an EU army. In his ‘State of the Union’ address to the European Parliament Wednesday morning, the boss of the EU’s unelected executive branch confirmed that the EU will create a “European Defence Union” by 2025. “And I want us to dedicate further efforts to defence matters,” he said. “A new European Defence Fund is in the offing. As is a Permanent Structured Cooperation in the area of defence. “By 2025 we need a fully-fledged European Defence Union. We need it. And NATO wants it,” he claimed. Before last year’s referendum on the UK’s membership of the EU, many prominent anti-Brexit voices dismissed the idea of an EU army. The UK vetoed similar proposals in 2011, and David Cameron and the Ministry of Defence (MoD) continued to deny an EU army was possible for years. In the run-up to the referendum, former Liberal Democrat leader Nick Clegg said an EU army was a “dangerous fantasy” of European leaders. “It’s not going to happen, it doesn’t matter whether Nigel Farage says it’s going to happen or Jean Claude Juncker… he [Juncker] can’t create a European army,” Mr. Clegg added. The Commission tried to keep the plans secret before the Brexit vote, fearing they would fuel Euroscepticism, but they were leaked in May 2016. “Mr. Juncker, that was the most open, honest, and truly worrying speech I’ve heard in my long years in this place. The message is very clear: Brexit has happened — full steam ahead! “There’s to be one powerful president for the whole of the European Union, a finance minister with fresh powers to, as you say yourself, ‘intervene’ as and when he sees necessary.